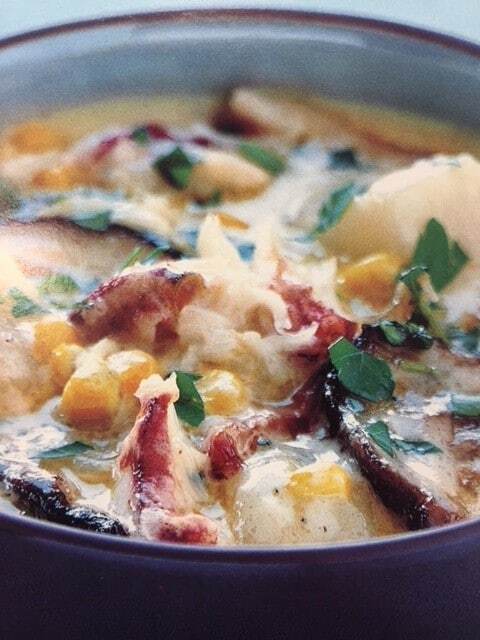 Corn Chowder with Mushrooms and Crab was one of the only dishes I would eat with mushrooms. There are a lot of ingredients – but it is very yummy in the end. And, I am teaching myself to ‘like’ mushrooms- therefore, recipes with them! I must admit that I often completely forget about the lump crab in the fridge because I am focused on the bacon – so, it is good with or without the crab. Serve with a nice crusty loaf of bread. 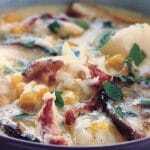 This is a wonderful special occasion soup that is delicious and worth the effort. We often have it without the fresh crab and it is still fantastic. This is a soup I saute things to a crisp tender and then put it all in the crock pot on low for 4-6 hours to enjoy at the end of a cool day. Cook your bacon! Or do it at the end of the day - the bacon crumbled is a topping for the soup. I personally use a bit (2-3 tbsp) of bacon drippings with the 2 tbsp of Cultivated Tree Olive Oil, but it's up to you and your time! Heat a large skillet to medium high heat and add the EVOO; add your onions, leeks, celery and fennel seed. Saute about 4 minutes until crisp tender. Add to a large slow cooker. Using the same skillet on medium heat, add 2 tbsp Butter Infused Olive Oil. Add the mushrooms, and saute until tender - about 5 minutes. Stir in the sherry and fresh thyme. Season to taste with salt & fresh pepper. Add to the slow cooker. This step is simply habit for me due to making the change to a slow cooker instead of cooking this on the stove top. In the same skillet, warm the cream and 1 box of chicken stock. It de-glazes the pan and starts the cooking process too. Add to the slow cooker. Add the additional box of chicken stock and the cubed potatoes to the slow cooker. Give a good stir to it all. Set to low heat for 4-6 hours. Head out and have a great day! Adjust salt and pepper prior to serving. Prior to serving - heat the crab meat in a skillet and divide among the serving bowls. Add the crumbled bacon and the chopped parsley. Ladle in the chowder mixture and enjoy. A crusty baguette goes well.